Before she met Inspire Suffolk, Marylou was a stay at home mum to her 6-year-old son. She was focussing on job searching at the Job Centre, however her depression was getting the better of her and her confidence was at a real low point. Marylou says that she was even scared of getting a job because of her mental health and confidence issues at the time. Another issue which she faced was having severe dyslexia which stopped her from getting qualifications at school. 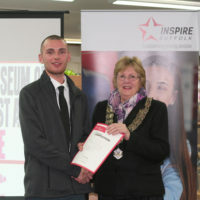 Marylou met one of our Inspire Suffolk youth workers at a job fair who told her all about our programme running in Sudbury for 12 weeks, the Prince’s Trust Team programme, which would most importantly help to build her confidence, build skills needed for work, and give her lots of experiences to allow her to progress onto a positive next step. She thought it sounded like a beneficial thing to do with her time fitting it around job searching and whilst her son was at school. When she got the call to tell her she had a place, she said she was really pleased, but didn’t know what to expect! At first, she was nervous. She didn’t go on the week-long team activity trip away because she had to look after her son, but she didn’t let that stop her. In the coming weeks her confidence in herself and within her team really grew, something which she now says really surprised her. 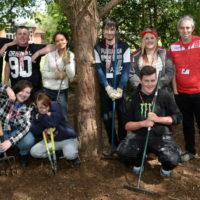 The course made her put herself into situations out of her comfort zone, including speaking to members of the public to get support for their community projects and work experience placements. She even took the lead with her Supporting Others project, asking people for help and to attend their event to support. 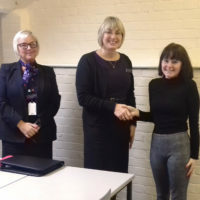 Her work experience placement was the highlight of her time with Inspire Suffolk. Marylou spent two weeks volunteering at an Oxfam charity shop, working on the tills, cash handling, and sorting stock. She had done this years ago, before her son was born, however she felt like she was in a much better place to do it now with her new-found confidence. She enjoyed this so much, she continued to volunteer at the shop once she had completed the course whilst she was job searching. She also conquered her fears and stood up in front of a room full of people at her Graduation Presentation at the end of the course, to talk about her journey, how she had overcome her mental health and confidence issues and was now in a much better place in her life. Since then, Marylou has secured a job at her local McColls convenience store and is really loving working there and having some structure. She currently works 3 evenings at the store and is the first person they will call with overtime opportunities as she has proved herself to be hardworking and willing. She is also now focussing on herself and gaining her qualifications which she didn’t gain at school. She has completed her Level 1 Maths qualification this September and now will be focussing on her Level 2. She has her sights set on achieving her English qualifications too, to help her move up the career ladder and support her son. Her ambitions don’t stop there, with hopes to move up in her career and hopefully become a supervisor in the retail sector. Marylou is just one of the many young people that Inspire Suffolk supports to overcome a range of challenges and to strive for a positive next step in their lives. Find out more about what we do here.